Hvar island is firmly on Croatia's tourist circuit as one of the most-visited of the many Adriatic islands dotting the Dalmatian coast. 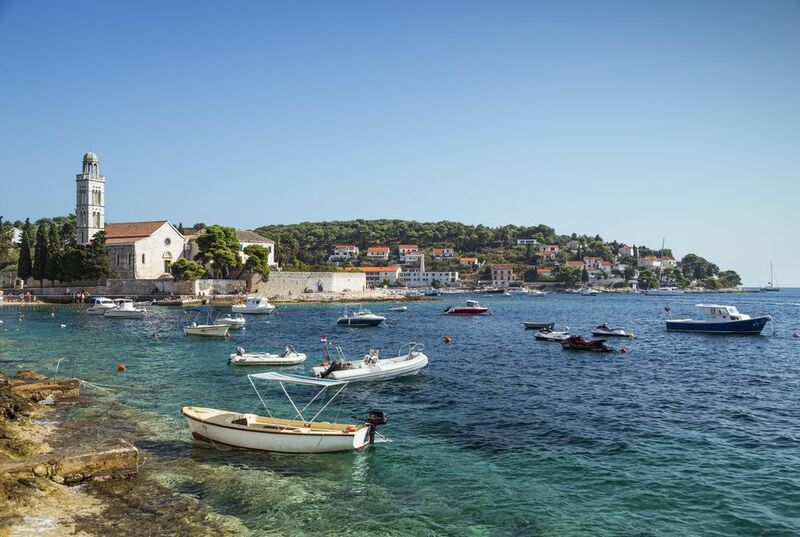 Its reputation as a swanky destination for Hollywood stars and international jet-setters has attracted much media attention and ever increasing prices, but more recently the fact that Hvar is also a draw for rowdy revelers has earned it a less glamorous standing as a party island. That said, most of the partying happens in Hvar Town and the island has a lot more to offer than open-air nightclubs and champagne breakfasts. Here's a guide to the top things to see and do on Croatia's sunniest island. Built between the 15th and 17th centuries by the Venetians, the medieval streets and buildings of the walled old town can be easily explored on foot thanks to the fact that it's a car-free zone. Looming over its medieval skyline is the bell tower of St. Stephan's Cathedral, which also dominates one end of the main square or “pjaca”. At the other end is another imposing building: the late 16th century Arsenal which was once used by the Venetian military and today houses a contemporary art gallery and Europe's oldest theater (which first opened its doors in 1612). Perched on a hill overlooking the old town is the 16th-century Fortica, also called the Spanish Fortress. The challenging climb up is worth it just for the panoramic city views, sweeping seascapes, and glimpses of nearby islands. During the summer months, sun-worshipping beach lovers descend on the island's most popular beachside hotspots. Just outside Hvar Town, Mekićevica has a lovely pebble beach, and the sandy shoreline tucked into a protected cove at Milna is just under four miles from Hvar town. A little further east is Zaraće where two coves hide tidy pebble beaches, and picturesque Dubovica, from where a steep path leads to a bay with see-right-to-the-bottom turquoise waters. There are also several clothing-optional beaches to choose from, with the most popular probably being the deserted island of Zečevo, which is just a short boat taxi ride away from the port of Jelsa. Tucked into a long narrow bay, Stari Grad is the oldest town in Croatia, having been settled by the Greeks way back in 384 BC. The handsome Biankini Palace houses the town museum where Greek vestiges like coins, ceramics, and stonework are on display. Tvrdalj Castle is another popular tourist attraction that was once the summer retreat of Petar Hektorović, a 16th-century poet. The atmosphere is tranquil and romantic thanks to architectural details like the charming walled garden, a fish pond enclosed in a vaulted arcade and an old-fashioned dovecote. Visit one of the island's many traditional eateries called “konoba” to have a taste of authentic local cuisine served in a rustic atmosphere. This is very much a slow food experience where local specialties are prepared home-style and seafood dishes like grilled fish, clams, octopus and mussels dominate the menu. The island's signature dish is “ gregada”, a stew made of fish, potatoes, onions, garlic, parsley, and olive oil. Thanks to Hvar's sunny climate, there are plenty of vineyards here producing some of Croatia's best wines. In addition to “Plavac Mali”, a red that's a fast favorite all along Croatia's coast, the island also has its very own white varietals, like the dry “Bogdanusa” and the more fruity “Prč”. Visit one of the many wineries on the western part of the island for to sample them all, or join a wine tour to meet local winemakers and learn more about Hvar's wine industry. Just five miles east of Hvar Town is this popular natural landmark and one of the island's most magical places to have a swim. This is an impressive cliff face made of layers of red-stained limestone and carved with vertical hollows that fall dramatically into the sea. The only way to reach it is by boat from Hvar Town which makes getting here part of the adventure. Visible from Hvar Town's coastline is a smattering of over a dozen forested islands that can be easily reached by boat taxi or as part of the many excursions organized by local travel agencies. Visitors can explore the islands' many secluded coves and beaches and spend a day swimming or snorkeling in their clear waters. Sveti Klement is the largest of these islands, while Marinkovac has the best pebble beaches at Zdrilca, and Stipanska, where the trendy Carpe Diem Beach Club is located. Jerolim is reserved for those who like to bathe in the buff and according to CNN Travel, is among the world's top nudist beaches. Hvar island has its fair share of ghost towns left behind by former inhabitants who eventually moved to larger cities or even abroad. Tiny, charming Humac is a good example: first inhabited in the 17th century, shepherds and farmers once lived here, tending their sheep, vineyards, and lavender fields. Now uninhabited for over a century, today Humac is an open-air museum of sorts offering a glimpse into times past. Its centuries-old stone houses, as well as a church and local “konoba” (tavern), remain open during the tourist season. At 1150 feet above sea level, the panoramic views from here are of terraced vineyards and seascapes. One of Hvar's monikers is the “island of lavender” because of its sweeping lavender fields that can rival those of Provence. Early summer is when the blooming season reaches its peak and the whole island is perfumed by the flowering plant's heady fragrance. Visit the area around the tiny village of Velo Grablje (eight miles east from Hvar Town) for the full experience. This is also where the annual lavender festival is held every June. This UNESCO World Heritage Site is a fascinating example of an ancient Greek land parcel system called “chora” that dates back to the 4th century BC. The plains cover an area of 3400 acres between the towns of Stari Grad and Vrboska, and are divided into a geometrical parcel system and bordered by dry stone walls. These are agricultural lands that were cultivated by the ancient Greeks, and today grapes, olives, and figs are still cultivated here. The best way to explore the area is by bicycle or on foot thanks to the many biking and walking trails.